Adaptive value is the affect that a behavior has on the reproductive fitness of the organism. Many researchers have postulated what sexual cannibalism could add to the reproductive fitness of both participants – the male and the female. Some believe that the behavior is adaptive (in that it confers reproductive benefits onto the individual), while others argue that the behavior is maladaptive and evolved for other reasons. In the males perspective, there are two main hypotheses: one arguing that sexual cannibalism is adaptive for the male (Adaptive Suicide Hypothesis) and the other arguing that it is maladaptive for the male (Maladaptive Hypothesis). The Maladaptive Hypothesis is currently the most widely accepted hypothesis. There are four hypotheses that have been proposed to explain how sexual cannibalism could increase female fitness or could have developed as a result of other selective pressures: Foraging Strategy, Female Mate Choice, Aggressive Spillover, and the Life-History Strategy. Currently, the Foraging Strategy hypothesis is the most widely accepted, though there is evidence refuting this hypothesis and in support of the other hypotheses. Listed below are further explanations and evidence for each of the hypotheses. Adaptive value for males: adaptive or maladaptive? Adaptive Suicide Hypothesis: One hypothesis that has been introduced to explain the adaptive value of sexual cannibalism for males is the adaptive suicide hypothesis. According to this hypothesis, sexual cannibalism is adaptive for males because they gain more by investing in the health of their offspring (by allowing the females to eat them) than they would by subsequent matings (Brown, Muntz, and Ladowski, 2012). Maladaptive Hypothesis: In contrast, many researchers have argued that sexual cannibalism is not adaptive for males since it destroys their reproductive fitness, in the sense that they cannot continue to mate and thus produce more offspring. This hypothesis is supported by evidence of strategies for males to avoid being sexually cannibalized (Maxwell, 1998: “Lifetime”). Maxwell found that males mount from behind and mount well fed females to reduce their risk of being eaten. Males also increase their risk taking (that is approaching a hungry female) when that male has had less female encounters, indicating that males will take more risks if there is a shortage of females in the population (Brown, Muntz, and Ladowski, 2012). It has also been shown that males are more cautious and will court for longer if he believes there is a risk of being cannibalized (Lelito and Brown, 2006). Foraging Strategy Hypothesis: To explain the adaptive value of sexual cannibalism for females, some researchers have proposed the foraging strategy hypothesis. This hypothesis conjectures that sexual cannibalism increases the ability of the female to produce healthier or more numerous offspring by providing females with extra nutrients. This hypothesis is one that supports that the behavior increases the reproductive fitness of the females, and is thus an adaptive behavior for female praying mantises. This hypothesis is supported by evidence that sexual cannibalism improved female body condition and caused the females to produce heavier ootheca (see Figure 1 and 3) (Barry, Holwell, and Herberstein, 2007; Birkhead, Lee, and Young, 1988). If the behavior provides females with the necessary nutrients to produce offspring, the behavior should be more common in under nourished individuals than in well fed individuals, who do not need the extra nutrients. Researchers have supported this hypothesis when they found that well-fed females were less likely to cannibalize their mates than poorly fed females (Maxwell, Gallego, and Barry, 2010). Figure 1. This figure shows that improved body condition does affect the quality of the ootheca produced. Taken from Barry et al. 2007. Research that supports this hypothesis has also been done in other sexually cannibalistic insects. For instance, it has been found that hunger in redback spiders is a significant predictor of cannibalism (Andrade, 1998). 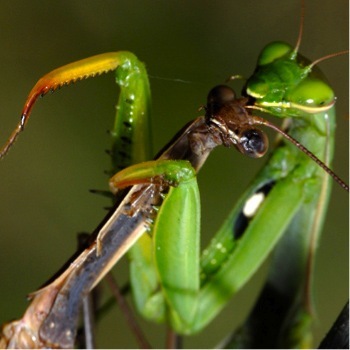 Although extensive experimental results have shown that starvation could be the determining factor for the occurrence of sexual cannibalism in praying mantises, this may not be the case for other sexually cannibalistic insects. A study done in fishing spiders found that female foraging, female mating status, female size, male size, and time of season all had no effect on the chances of female cannibalism nor did cannibalism increase the fecundity of the female (Arnqvist and Henriksson, 1997). Female Mate Choice Hypothesis: This hypothesis argues that sexual cannibalism is not influenced by hunger, but is a strategy to dispose of unappealing mates. This hypothesis is supported by evidence that smaller males are more likely to be eaten than larger males, supposing that small size is a negative trait (Elgar and Dash, 1986). This evidence opposes the foraging strategy hypothesis, since that hypothesis supposes that, if males are eaten for their nutrients, larger males should be eaten more often since they will provide a better meal for the females. Contrastingly, later research found that there was no difference in size between cannibalized and non-cannibalized males (Barry, Holwell, and Herberstein, 2007). This hypothesis has been supported by research done in another sexually cannibalistic species of spider. Research done on size dimorphic spiders found that less aggressive males were cannibalized more often than more aggressive males, which could indicate that aggression could be a positive phenotype and that females are choosing their mates based on this trait (Kralj-Fiser et al., 2012). Figure 3. The graph, taken from Kralj-Fiser et al. 2012, shows that in a species of spider, aggression is seen as an attractive quality in a mate (b) and that the probability of cannibalism decreases the more aggressive the mate is. This could support the theory that cannibalism is a method of mate choice. Although evidence supporting this hypothesis sees sexual cannibalism as a mechanism of mate choice, this evidence can also be viewed as evidence supporting the foraging strategy hypothesis, in that females target smaller and less aggressive males because they are easy meals. Also, this hypothesis seems to only pertain to cases of pre-mating cannibalism and does not explain post-mating cannibalism. Aggressive Spillover Hypothesis: This hypothesis conjectures that females are selected for aggression during development (since increased aggression allows for better hunting skills) but that this behavior becomes maladaptive in terms of mating, since it gets rid of potential mates (Arnqvist and Henriksson, 1997). This hypothesis was introduced when researchers, Arnqvist and Henriksson, who were studying fishing spiders found no correlation between cannibalism and mate choice nor between cannibalism and foraging. This conjecture is refuted by further evidence that female spiders who were more aggressive towards prey and other females were not actually more likely to cannibalize their mates than less aggressive females (Kralj-Fiser et al., 2012). Life-History Strategy Hypothesis: This hypothesis estimates that sexual cannibalism is the maladaptive result of females who have an increased foraging instinct to raise their body mass because they matured at a smaller size than other females. Researchers attempted to support this hypothesis by showing that cannibalistic females still gained more body mass than non-cannibalistic females even when the nutrition gain was removed (by removing the bodies of the male after they were killed but before they were eaten) (Schneider and Elgar, 2002). 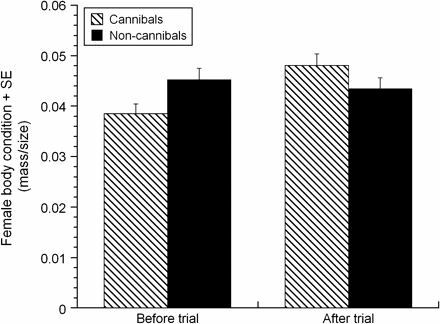 By removing the nutrition gained from the act of cannibalism, the researchers showed that the behavior is the maladaptive result of increased foraging vigor, and that the behavior is not aimed at achieving direct nutritional benefit from killing the males (in contrast to t\he foraging strategy hypothesis). This hypothesis is opposed by evidence that there is no size difference between cannibalistic and non-cannibalistic females, and thus cannot be a strategy only used by smaller females to gain body mass (Barry, Holwell, and Herberstein, 2007), although cannibalistic females were in worse condition (see Figure 3). Figure 3.The difference in body conditions between cannibals and non-cannibals after the mating trial. Cannibals had significantly improved body conditions after cannibalizing their mates. 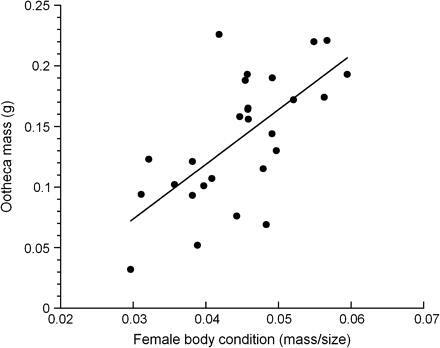 But it is also interesting to note that the cannibalistic females started with worsened body conditions compared to non-cannibal females.This evidence that cannibalism can improve female body condition supports that Foraging Strategy Hypothesis. Taken from Barry et al.2007.